Fresnel spotlights (pronounced freh-nell) produce a soft-edged beam that is well-suited to washes and specials. Fresnels consist of an incandescent lamp, a mirrored parabolic reflector, and a round fresnel lens. It is this lens that lends the instrument both its name and its characteristic of having a soft focus. 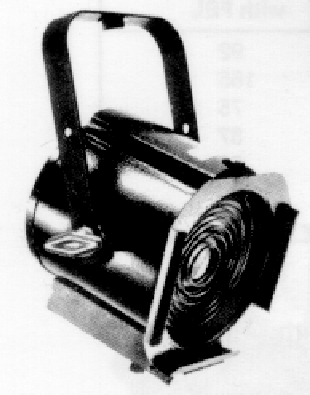 Fresnel spotlights come in a few sizes, the most common of which are three, six and eight inch. This figure refers to the diameter of the lens used on the instrument. Adjustments allow the focusing of the beam from spot to flood. Provisions for color frames are generally present on the front of fresnels. Figure 5.5 depicts a typical fresnel spotlight. Figure 5.5: Typical fresnel spotlight.